THE ADVENTURES OF TRAIN TRAVEL IN AMERICA! 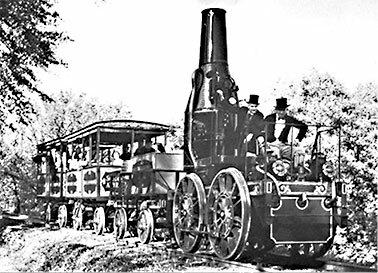 In 1830, the first locomotive built in the USA, named "The Best Friend of Charleston," was considered one of the fastest modes of transport available, taking its passengers "on the wings of wind at the speed of fifteen to twenty-five miles per hour." After the driving of the Golden Spike at Promontory, Utah, in 1869, higher passenger train speeds made possible an 83.5 hour trip on the Transcontinental Express, at an average speed of 41 mph. Thanks to the astonishing progress made by the American railroad industry in the last century and a half, Amtrak can now whisk you on this same trip, Coast to Coast, in 71 hours, at an average speed of 48 mph! NO MORE AMTRAK TICKETS. NOW WHAT? As of September, 2016, travel agents are longer able to book and ticket Amtrak on their in office reservations systems. Due to changes initiated by the Airlines Reporting Corporation (an entity owned by the airline industry that Amtrak has depended upon to interface with travel agencies), the printing of paper tickets and customized detailed itineraries is no longer possible. Amtrak might have provided agents with a workable reservations alternative, but the only option they offer is a cumbersome airline style internet booking engine lacking most of the functionality that has been so useful to agents for over three decades. Even if you are computer savvy, Amtrak.com can be quite daunting if you want a multi-segment trip. If you have any special requests, such as specific cabin locations, or would like to know if changing your dates of travel can reduce your fare substantially, it is impossible to accomplish this on the Amtrak internet site. What if you would like to browse Amtrak route maps and schedules or you want a copy of an Amtrak timetable? You will have to go down to your Amtrak station to pick one up, or call Amtrak and ask them to mail you one. 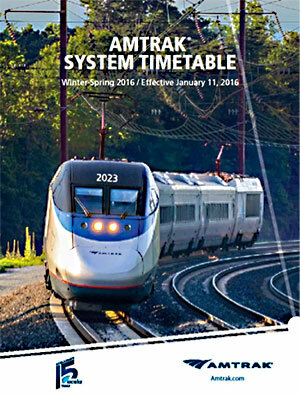 But the last Amtrak System Timetable printed was dated January 11, 2016, and there will be no more Timetables printe. Ever. Saves on paper and printing costs. If you are internet savvy, and really want a current Timetable, it is available on Amtrak.com as a PDF document, 137 pages. Have plenty of printing paper and some extra printer cartridges on hand. Here is the link to the October 2016 Amtrak System Timtable. January 11, 2016. May be a collector's item some day. While Amtrak provides live agent assistance at 1 (800) USA RAIL, many travelers have consulted travel agents because agents can provide service not always available from Amtrak. Most agents have more years of experience than Amtrak staffers. They can provide advice about which connections are reliable, and which "trains" in the timetable are really motor coaches. (We have an acquaintance who booked her trip directly with Amtrak and was unpleasantly surprised to find herself on busses throughout her journey). They also can explain what the onboard amenities are like as well as the locations of the best bedrooms or roomettes. Most travel agents have already stopped issuing Amtrak tickets. More will follow, considering the poor options available to them now. If you prefer talking to a person familiar with Amtrak’s connections and amenities, there are ways around this. 2. Google "Amtrak Travel Agency"
3. Phone Amtrak at 1 800 USA RAIL. Be prepared to navigate past the robotic voice of "Julie" and listen to the sound of contemporary "music" on hold, before being able to speak with a live agent who will be friendly and helpful, but may or may not know what the most desirable connections are. Keep in mind that an experienced travel agent will have this information. If you really believe you are Internet savvy, you can, of course, book your tickets on Amtrak.com. Most of the new clients who find our agency are those who have attempted this, become frustrated, and have then reached out to us for assistance. Enhancement. I just looked it up in the dictionary. It means: "An increase or improvement in quality or value." That is a 20th Century definition. 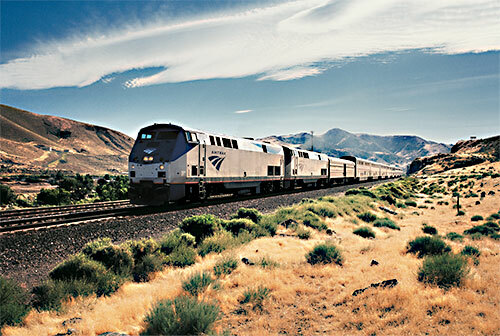 This year the Bank of America issued a new MasterCard , with “enhanced” benefits for Amtrak Guest Rewards members. Points accrued on the former Chase Bank Guest Rewards MasterCard were transferred to our new B of A account. As skeptical 21st Century citizens, we were not surprised to learn what had happened to our transferred 25,000 points. These points had been sufficient to reserve a bedroom from Klamath Falls to Denver and return in December 2015. Unfortunately we had to postpone our trip. The new B of A card arrived along with news about our "enhanced" Guest Rewards plan. To book the same trip now, we will have to collect an additional 50,000 points to add to our original, and now extremely deflated, 25,000 points. "This is an enhancement for Amtrak, not for passengers," Ted explained. 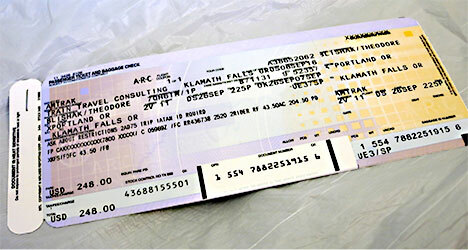 "They won't have to issue as many free tickets, and it’s not just Amtrak. Airlines have been nibbling away at the value of their frequent travelers' points for years, and Amtrak is just catching up." While Amtrak Guest Rewards bookings can be made on the Internet, there may be times when you have to telephone them, as I did when I found my Guest Rewards Account had been "locked." I asked the Guest Rewards agent to book a Lamy to Los Angeles bedroom. The Amtrak staffer asked me, ‘Where is Lamy?’ I didn't think I should I have to explain something as basic as that, but I did anyway. "Lamy is the transfer point from Amtrak's Southwest Chief to the Amtrak Shuttle Bus to Santa Fe, New Mexico, one of more popular tourist destinations on the Amtrak Route Map." The new "enhanced" Guest Rewards program is based on ticket prices rather than the regional zone system used in the past. After many years of use, some unidentified "bean counter" at Amtrak realized that savvy travelers were gaming the system. 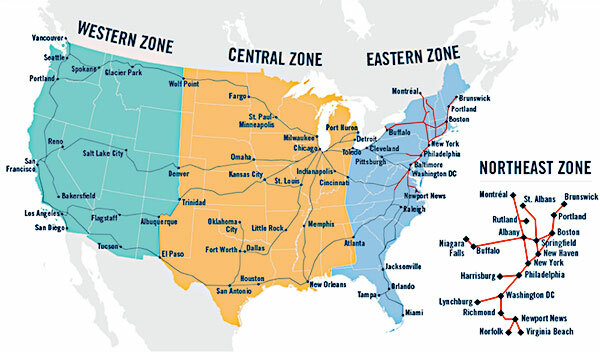 Notice that Seattle and Denver, a journey of 2139 miles, are in the same Western Zone, while in the Eastern Zone, New York to Miami is only 1389 miles. Obviously the traveler in the West could get more miles for his points than the hapless Easterner. Not anymore. In order to get the most value from your points, you now need to book months ahead. Amtrak can have five different fares for the same bedroom. There is absolutely no difference in the room, it is merely an inventory control scheme. The least expensive fare categories are offered first, then the price goes up, whether in dollars or points. Thus if you are reserving a group of three identical bedrooms, all at the same time, for your family or group of friends, the first bedroom confirmed could be at the lowest price. The next confirmed will be next up the price scale, and the third still higher - perhaps a room at three times the price of the first one! One reason travel agents are useful is that they understand and explain the illogical side of train travel. 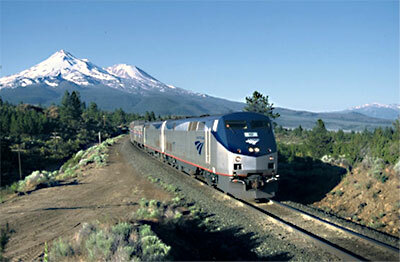 on its northbound run between Los Angeles and Seattle, via Klamath Falls. Chinese Dolphin Blue Bullet Train. 261 mph. July 2016.